In 2002, outcomes for patients with ruptured cerebral aneurysms were reported in the International Subarachnoid Aneurysm Trial (ISAT). The trial compared mortality and clinical outcomes of patients with aneurysmal SAH who were treated with either surgical clipping or endovascular coiling. The study found that patients who underwent coiling had lower mortality and better outcomes at 1 year than those who had open surgery. As a result of the ISAT findings, it was assumed that more clinicians in the United States would begin treating ruptured aneurysms with endovascular approaches. In the May 2012 Journal of Neurointerventional Surgery, Dr. Friedlander, Ning Lin, MD, and colleagues published an analysis describing patterns of use and in-hospital mortality associated with surgical and endovascular treatments of cerebral aneurysms over the course of a decade. The investigation reviewed data from nearly 35,000 hospital discharges with a diagnosis of ruptured or unruptured cerebral aneurysm from 1998 to 2007 from the Nationwide Inpatient Sample. The final analysis involved 20,134 discharges with a ruptured aneurysm and 14,765 discharges with an unruptured aneurysm. According to findings, the number of patients discharged with a ruptured aneurysm was stable, while the number discharged with an unruptured aneurysm increased significantly over the 10-year period. The use of coiling increased at least two-fold for both groups of patients, with the majority of unruptured aneurysms treated with an endovascular approach by 2007 (Figure 1). Overall, Caucasians were more likely than non-Caucasians to undergo coiling versus clipping for a ruptured aneurysm. Men with unruptured aneurysms were more likely than women to undergo coiling. However, the significance of these demographic factors lessened over time. “By 2007, the differences in treatment selection by gender and racial subgroups decreased or were statistically non-significant,” adds Dr. Lin. 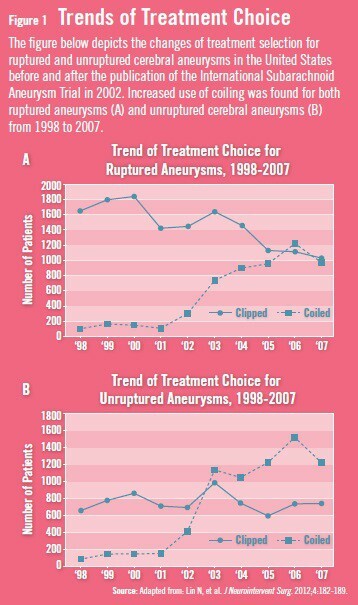 Data also revealed that 90.7% of ruptured aneurysms and 79.4% of unruptured aneurysms were treated with clipping before 2002, but these rates decreased to 57.1% and 38.3%, respectively, after 2002 (Figure 2). In addition, the analysis showed that use of coiling spread from primarily large, teaching hospitals to smaller, non-teaching hospitals. “These results suggest that dissemination of endovascular procedures appears to be widespread across patient and hospital subgroups,” Dr. Lin says. Older age, higher income level, public healthcare coverage, teaching hospital admission, and non-emergency presentation were associated with a higher likelihood of coiling for both ruptured and unruptured aneurysms. Endovascular coiling was associated with lower in-hospital mortality for patients with unruptured aneurysms, but the mortality for either treatment was still low, says Dr. Friedlander. “For the SAH group, coiling was associated with higher in-hospital mortality, a difference that was consistent over the study period.” He adds that this finding could be explained by the fact that patients with SAH who underwent coiling were older and had more comorbidities than those who were clipped. Notably, mortality was lower for patients at smaller hospitals than for those at larger hospitals. This may be the result of smaller hospitals transferring more complex patients to larger medical centers. Lin N, Cahill KS, Frerichs KU, Friedlander RM, Claus EB. 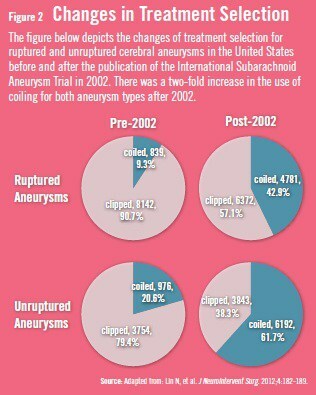 Treatment of ruptured and unruptured cerebral aneurysms in the USA: a paradigm shift. J Neurointervent Surg. 2012;4:182-189. Available at: http://jnis.bmj.com/content/4/3/182.full.pdf+html. Molyneux A, Kerr R, Stratton I, et al. International Subarachnoid Aneurysm Trial (ISAT) of neurosurgical clipping versus endovascular coiling in 2143 patients with ruptured intracranial aneurysms: a randomised trial. Lancet. 2002;360:1267-1274. Hoh BL, Chi YY, Lawson MF, et al. Length of stay and total hospital charges of clipping versus coiling for ruptured and unruptured adult cerebral aneurysms in the Nationwide Inpatient Sample database 2002 to 2006. Stroke. 2010;41:337-342. Andaluz N, Zuccarello M. Recent trends in the treatment of cerebral aneurysms: analysis of a nationwide inpatient database. J Neurosurg. 2008;108:1163-1169. Cowan JA Jr, Ziewacz J, Dimick JB, et al. Use of endovascular coil embolization and surgical clip occlusion for cerebral artery aneurysms. J Neurosurg. 2007;107:530-535. Komotar RJ, Mocco J, Solomon RA. Guidelines for the surgical treatment of unruptured intracranial aneurysms: the first annual J. Lawrence pool memorial research symposium controversies in the management of cerebral aneurysms. Neurosurgery. 2008;62:183-193. Hoh BL, Rabinov JD, Pryor JC, et al. In-hospital morbidity and mortality after endovascular treatment of unruptured intracranial aneurysms in the United States, 1996-2000: effect of hospital and physician volume. AJNR Am J Neuroradiol. 2003;24:1409-1420. Alshekhlee A, Mehta S, Edgell RC, et al. Hospital mortality and complications of electively clipped or coiled unruptured intracranial aneurysm. Stroke. 2010;41:1471-1476.